I have been spinning and sewing. I’ve been bad at taking photos. But here’s one from my room, where the chaos at least shows I’m working. 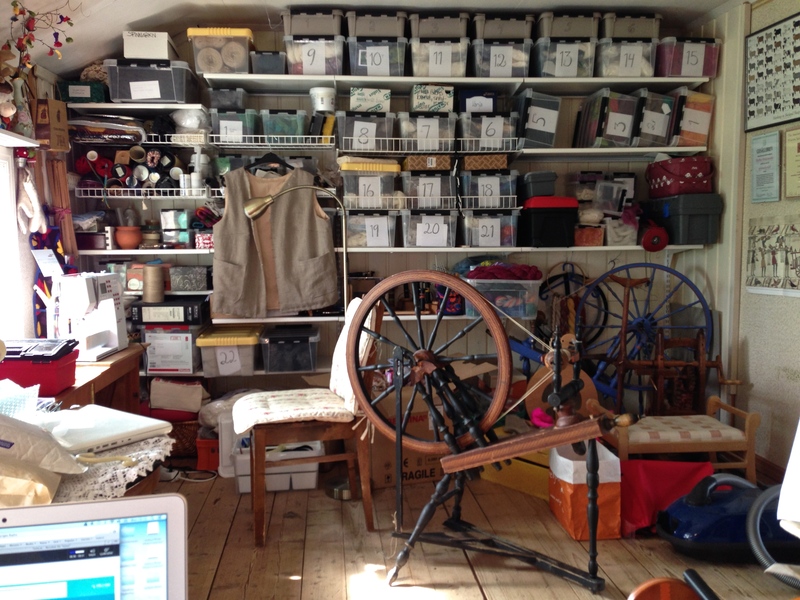 I’ll tidy it up this week so a spinning friend from Sweden who’s coming to visit me next week will have space for her wheel. We’ll spend a fiber day together! The brown-black Saxony wheel is one I bought a few weeks ago to replace my blue faithful servant from 1896. It’s made by a well known Finnish spinning wheel factory in Kiikka. I have no date for it, but probably around WWII. It’s well used, which I hold for a good sign in old wheels. You don’t want to spin on wheels that aren’t good, do you? 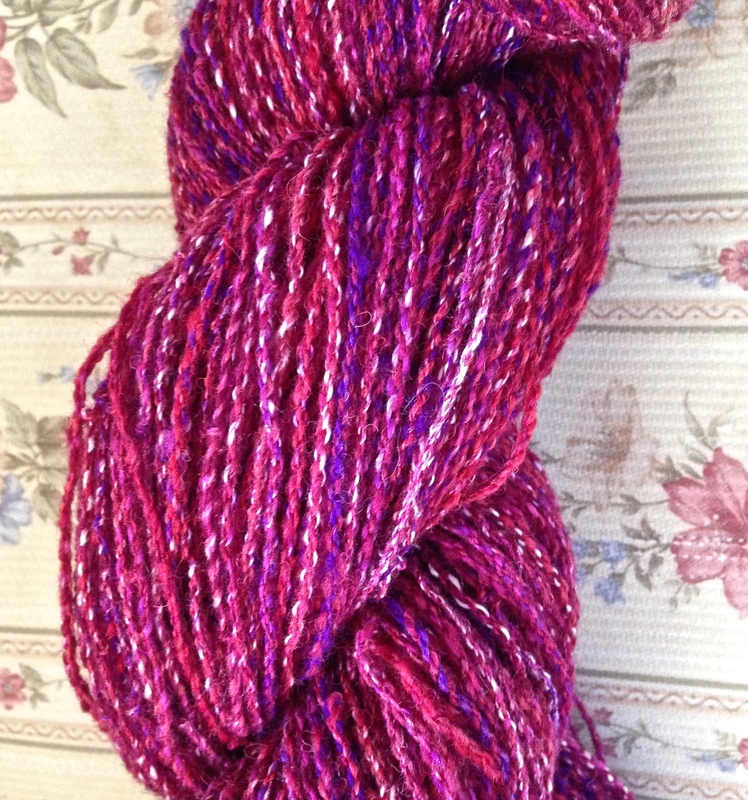 I haven’t had time to spin much on it yet, but I like the little I’ve spun. I hope July will be less busy. As for now I’m looking forward to the Nordic Knitting Symposium after Midsummer. 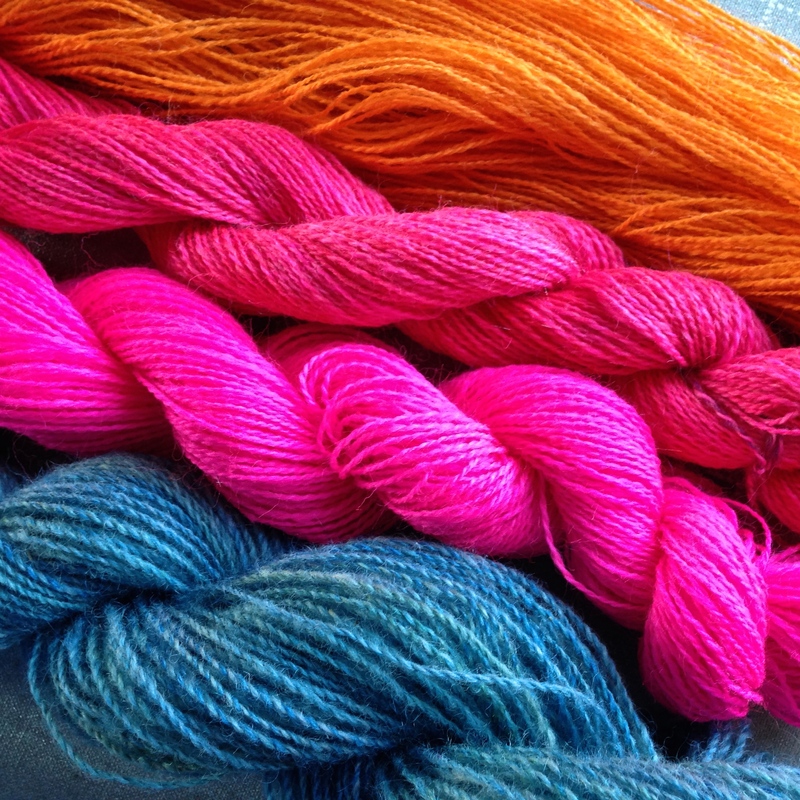 I’m spinning a few yarns I will use in the workshops I’ll attend. The work for my own teaching at the event is done, so now I can relax and concentrate on other tasks, like pink and orange yarns for my class in Estonian mittens. Our teacher is Kristi Joeste, and I really look forward to learning more about Estonian knitting. I also spin Z-twist yarn for a intermediate class in two-end (twined) knitting with Karin Kahnlund. A blue yarn is spun, today I spin orange for that class also. In May hubby and I had two dear guests from Sweden, Monika and her husband Inge. Monika is a new spinner, but very efficient in her learning. We spent an intense wool day together while the men went kayaking, and the next day spun at the outdoor museum where the members of my guild work in the summers. Now we’re looking forward to the Finnish Midsummer. It’s usually a cold and wet holiday, and as the weather report isn’t of any comfort this year either it may be my husband and I and the dog spend the night indoors. Living in a tropical region, India, I would have not got a chance to such a fantastic view of a busy spinner’s work place if I had not been in the blogosphere! I wish to spin like you! You have silk and cotton spinners, and I think there are wool spinners in the northern parts of India. I don’t have a charkha yet, but I hope to have one some day. Spinning cotton is fun! Oh, you know a lot about India! Yes, there are spinners in India… Hand spinning is done only/mainly by the weavers of traditional textiles. Could I ask you something if you don’t mind? What is the difference between the spinning wheels you are using and that is seen in India, i.e, charkha? The difference between charkha and a spinning wheel – long story… but shortly, the charkha is a spindle wheel, the wheels I use are flyer assembly wheels. Charkhas are for short, fine fibers, and in that they are very efficient. Wheels come in many different versions for different kinds of fibers and yarns. I won’t go into the techniques of the tools here, it would need far more space. 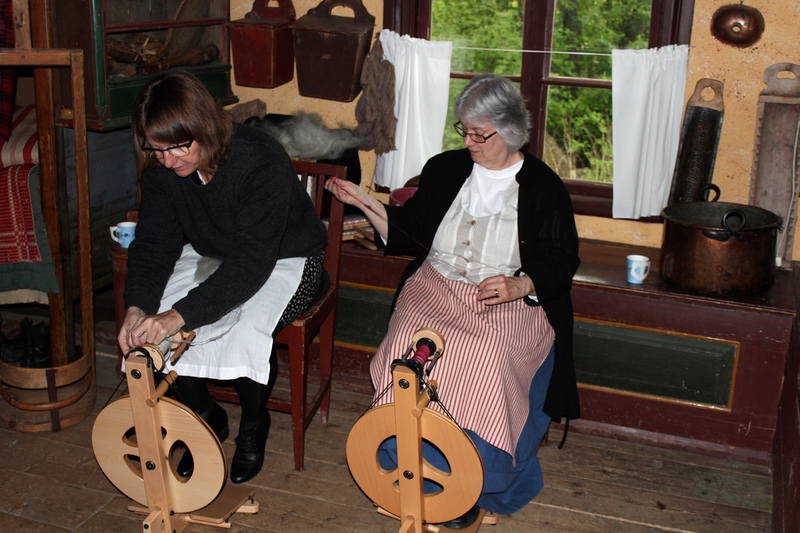 The Finnish wheels spin flax and short, fine to medium wools well, because that were the fibers we had when they were designed. Now the situation is different, and most spinners here need multi-purpose wheels for different kinds of fibers. The small travel wheels from Holland that Monika and I use in the photo from the museum are such wheels. Jag skulle nog inte kalla det där någon kaos alls jämfört med det rummet som någon gång ska bli mitt arbetsrum… 😀 Apropå, ska du komma till Hantverkardag i Stundars efter Sticksymposiet? Renovering på gång? Jo, jag kommer till Stundars 6.7. Inte ännu där uppe, men utrymmet skulle så småningom behöva röjas för användning så där överhuvudtaget. Trevligt, att du kommer till hantverkardag! Det tänkte vi med! You have so many exciting activities coming up…I am jealous!! Yes, I’ve been thinking I have to slow down, but then something pops up and I’m in before I know how it happened. I’m glad you like the wheel! I have to find bees wax for it yet. I want to polish the painted surface and I think bees wax wouldn’t damage it. Nice post and a lot to look foreward to! I looked at Kristi’s blog and Loved the Maple Leaf pattern on the mittens. Your colours for that class are electric 🙂 Awaiting your results. The new wheel is interesting for it’s colour choice. Was that normal? I assume it was painted. Apron vs yarn……whew…you did a good job! The Kiikka spinning wheel factory painted their wheels in those colours and they are therefore easy to recognise. In my community clear blue with red details was common, in other places the wheels were green or brown. !nteresting re the painted wheels. I like it!